ARE YOU TIRED OF SPENDING ON SOFTWARE UPGRADES? What if you never have to upgrade ever again? When it comes to software, the endoscopy market doesn’t give you many choices. You get to choose between software with bells and whistles that you never use or outdated technology that slows you down. Those aren’t even real choices. As a busy gastroenterologist, you need a smart way to complete your endoscopy report. Bill correctly, report back to referring doctors and patients. Setup recalls and stay compliant. Move on to your next case. You need to take care of your patients, not worry about software and compliance. Can’t there be a simpler way to simply plug and scope? The software that you buy and install in your premises ages quickly. Your vendor will compel you to upgrade because that's how they make money. First, you pay a big upfront cost. Then some more. For cables, libraries, data migration, multiple licenses, customization and an annual maintenance fee. What everyone misses is the fact that there will always be expensive upgrades and new versions. Yes, you can own a system fully but what’s the point of owning old, aging software. You will be forced to upgrade. Sometimes these upgrades feel like downgrades! You will have to learn new features suddenly. Things will slow down again. Every business has realized that it’s simply more efficient to be on cloud-based platforms that evolve themselves constantly. Unlike earlier years, there's a lot more to be done to stay compliant and get paid correctly. Today, doctors are running faster than ever to stay in the same place. With managed care, the balance of power slowly shifted from doctors to insurance companies and regulators. There’s a lot more work to be done for the same amount of money. Traditional software that doesn’t customize to your workflow, makes your staff work even harder and feel very frustrated. You may finish up your procedure and leave but your staff will spend valuable hours – that you pay for – battling software problems. It’s easier on everybody if they work with customizable software that doesn’t change the workflow. Servers not only increase your IT cost but also delay getting you the information you urgently need. Think of the last time you wished you could access your patient’s endoscopy report. Perhaps driving to the office was the only option for you. How much does an hour’s delay cost you when your procedure gets held up? Assuming average Medicare payments for a colonoscopy, delays caused by old technologies result in over $8,000/year in losses. Is it even worth it? Servers will not let you move around from your office. Servers cost expensive IT people and staff time. Servers are slow and clunky. Don’t let you work on multiple platforms. Servers break-down. Sometimes in between a procedure. Servers cost upfront money that no one will tell you about. It’s time for a robust, secure cloud-based endoscopy report writer. If you are using a traditional software system, the time has come to change it. Not just because one of the products is sun-setting in 2018 but because it’s time for change. Use this opportunity to advance your endoscopy suite to the future. Introducing enki Endoscopy Report Writer. We designed enki Endoscopy Report Writer (enki ERW) using our 12+ years of experience working with busy gastroenterologists. enki uses secure, HIPAA-compliant cloud technology from Amazon Web Services. It makes you more efficient. We’ve been working with gastroenterology practices of all sizes – solo practices to large groups – since 2005. That’s 12+ years of deep understanding of how you work. “A valuable asset to the GI community!" We invested over 4 years of effort and millions of dollars to build a robust, cloud and mobile-based EHR platform called enki. enki Endoscopy Report Writer is built on top of enki EHR. Sophisticated. More advanced technology than any other endoscopy report writer available in the market today. Here’s why Dr. John G. Stagias loves enki. “I have portability. My records are available in the office, in the hospital, in my endoscopy suite, at home and on the go. Today’s providers will demand this same portability in their EMR as they currently have with all other digital media. The mobile version allows me to maintain a degree of intimacy with my patients. My visit with the patient is done face to face without a cumbersome PC or laptop in between. Other systems without the mobile application do not afford this. Many patients who have been to providers using desktops in the exam room comment on how impersonal and detached those providers are, some even facing away from the patient during data entry. Medication interactions and allergies can be checked quickly and at any time. Imagine how this enhances patient safety when writing a prescription when the office is closed. enki Endoscopy Report Writer is entirely based on the most comprehensive and secure cloud technology. This means less than 1/10th upfront costs and reduced expenses in hardware infrastructure. It’s one-of-a-kind endoscopy report writer with the ease of use and a clinician friendly design. Suitable for busy gastroenterologists. Minimal Standards Terminology (MST) standards are built-in. Our proprietary clinical dictionary automatically generates clear and complete procedure notes from even the most complex procedures. This saves you a ton of time to accommodate more patients. 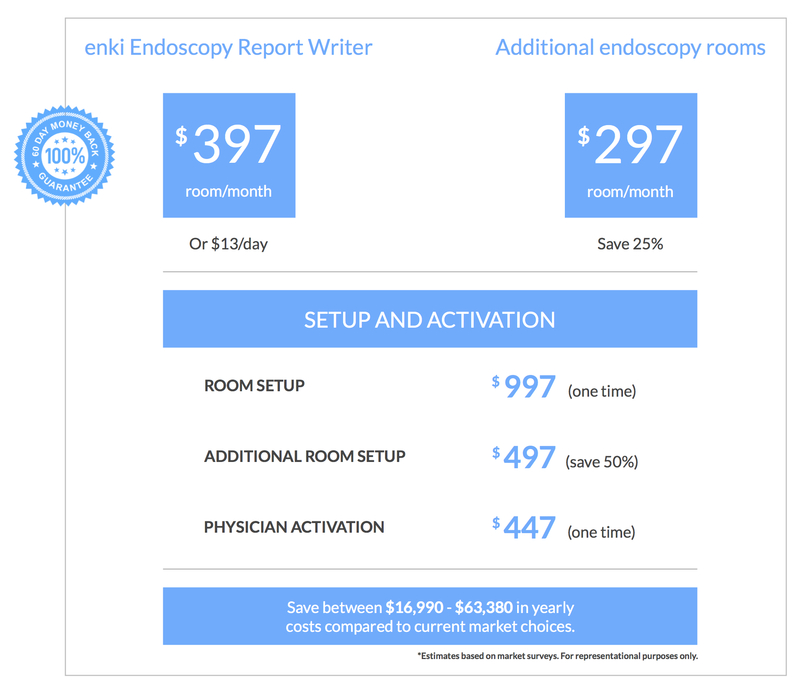 enki Endoscopy Report Writer consistently gives you correct coding options and allows you to capture accurate reimbursement codes and modifiers making billing quick and easy. Measure procedure quality by accurately documenting time taken to reach cecum and complete the procedure. Access from anywhere. 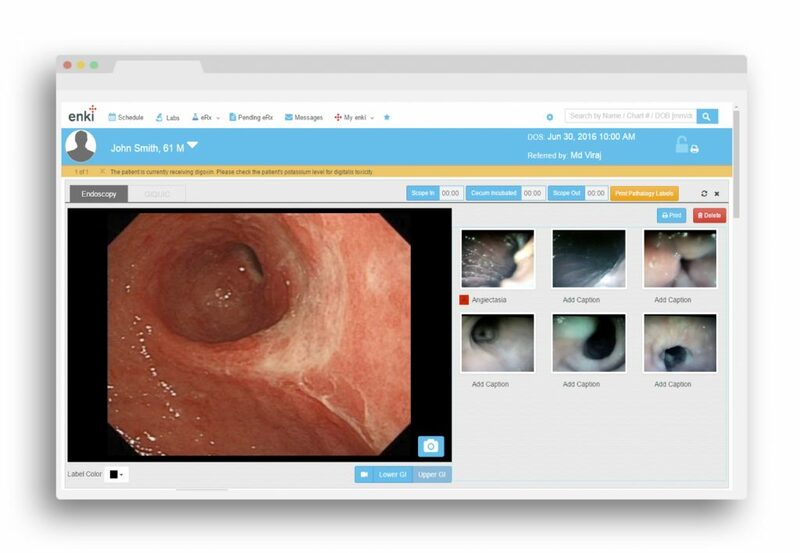 Cloud-based means you can access your endoscopy reports from anywhere. From your office, your hospital, your home and even from the golf course if you ever need to. Receive a FREE Adenoma Detection Rate Infographic. See a demo. You will love it. Endoscopy reporting solutions available in the market were built several years ago. Advancing such old technology is difficult, which most vendors are not ready for. Trying to make old technology work is expensive. That’s why the costs for upgrades, security patches and ongoing maintenance are passed on to you, making the lifetime cost of the product extremely high for you. enki Endoscopy Report Writer can easily integrate with your current EHR system (if your EHR vendor is open to an interface). It is also built on top of our enki EHR, a platform built for gastroenterologists – if you wish to benefit from a single system. 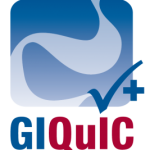 enki Endoscopy Report Writer effectively captures robust details for improving clinical documentation together with GIQuIC for quality reporting. 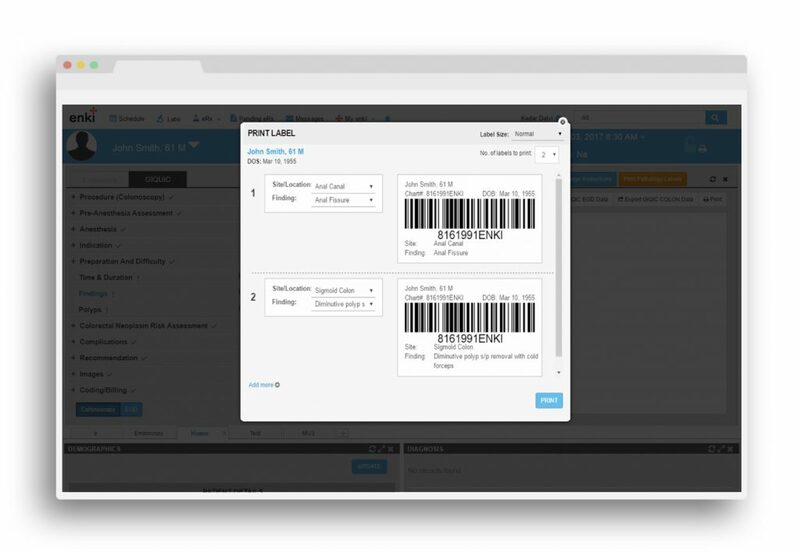 You will never miss a patient after using the recall report wizard. Review recall appointments beforehand and even send email reminders in bulk. Maintain care coordination by accessing generations of past medical records and easily share you reports with other providers through fax or email – directly from within the endoscopy software. Avoid the BIG mistake of using outdated software. Experience enki ERW and save both your time and money. “100% fantastic. Thank you all so much for doing such a great job. We are lucky to work with you all." “I would like to express my sincerest gratitude to you and your staff in helping us to correct the past and move forward on the right foot." “We are very pleased with the service and attitude of all the company’s personnel." “It's always great working with you and the rest of the staff at NextServices." We are so proud and confident of what we have built that we will refund full 100% of your money if you don’t like the product. The refunding process is simple. Use enki ERW to capture at least 300 images during a 60-day period. After that if you decide that the product doesn’t meet your needs, we’ll refund you the entire money. This guarantee covers you for a full 60 days. Try all the modules. If you don’t like it, just email us at ANY TIME during the 60-day period. By the way, the reason we ask you to show that you’ve captured images is because we know how powerful the system can feel when you actually use it. We have zero intention of keeping your money if you are dissatisfied. It’s a fantastic offer that NO ONE in the industry offers. 1) How much does this cost? 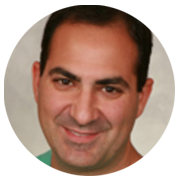 To run enki Endoscopy Report Writer in your endoscopy room, it’ll cost you around how much you spend on lunch every day. Costs depend on the number of doctors and endoscopy rooms. Instead of huge upfront costs and heavy maintenance fees, we charge monthly. You could save money if you do choose to pay annually. 2) What will happen to my existing operative notes and images? If you have paper records, we will provide a document management module called “Upload Charts” for you to scan and store past records within a patient account. Usually, our clients do this after a certain patient is scheduled. If you have electronic copies available and can provide them to us in bulk, we will upload them from the backend and make them available to you. 3) Will I need to hire more staff? No! In fact, once you become comfortable with enki Endoscopy Report Writer, you will find that you and your staff will save a lot of time. 4) How much time will I need to invest to learn your system? Before the go-live date, we will do a pilot run on your endoscopy machine. You will be able to test and see how to capture images and document reports. Most people figure out how to use enki Endoscopy Report Writer in less than a day. Within a week, you will be totally comfortable. Like a lot of our users, you will realize that it’s really simple to use. 5) Is cloud-technology safe? Is it HIPAA compliant? In order to meet the HIPAA requirements applicable to our operating model, AWS aligns our HIPAA risk management program with FedRAMP and NIST 800-53, a higher security standard that maps to the HIPAA security rule. NIST supports this alignment and has issued SP 800-66, "An Introductory Resource Guide for Implementing the HIPAA Security Rule," which documents how NIST 800-53 aligns to the HIPAA Security rule. About one-third of Meaningful Use certifications pertain to patient confidentiality and security. The enki platform has been through rigorous certification processes that test for bank-grade encryption. 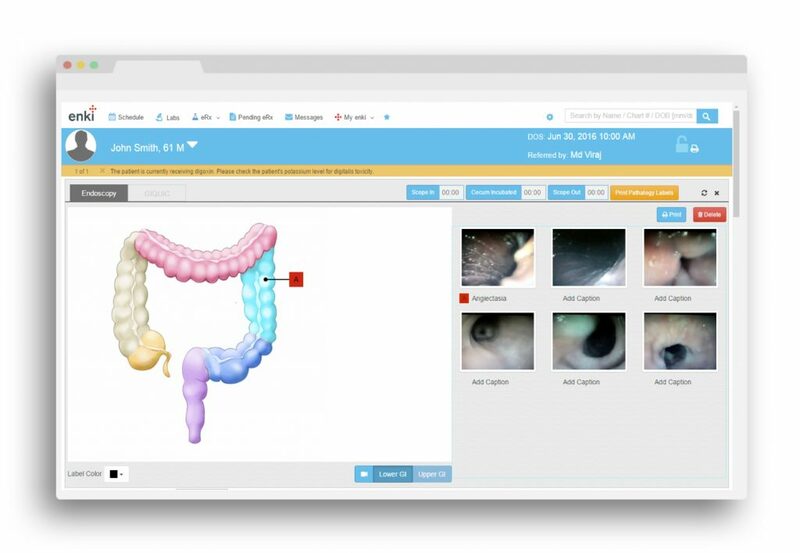 enki Endoscopy Report Writer is hosted within the wider enki platform. Settings within the system track every single user by the millisecond. It allows for restricting access to a range of IP addresses that belong to your facility. 6) Our hospital/surgery center recommends hosting on our premises. How can we take advantage of enki Endoscopy Report Writer cloud then? We understand that your facility may have internal rules to comply. You have a few options – we could host a private cloud within AWS for your facility. If you are a large facility, we could explore hosting enki Endoscopy Report Writer within your premises. Talk to us about your specific needs. 7) I don’t like changing the way I create my operative notes. Can you customize enki Endoscopy Report Writer for my needs? Yes, we will. The benefit of enki’s advanced modular design is its ability to personalize itself for your specific needs. We will tell you upfront if something is beyond the scope of what the software can do. But we know from experience that we can fully adapt to your workflow. Our clients love working with us and routinely rate us 9 on 10. Experience enki for yourself. You will love it. 8) What kind of support do you offer? We offer email and phone support from 8AM EST to 6PM EST. Our clients find that the quickest way is to drop us an email. We are usually very responsive. Our team aims to resolve issues within 12-48 hours depending on severity. 9) Do you have downtimes when enki Endoscopy Report Writer will not work? Most of our updates happen while you sleep. We maintain 99% uptime. 10) Will I need to upgrade in the future? Never. With cloud-technology you are getting upgrades for life for free! 11) Will using enki Endoscopy Report Writer help me code, bill and get paid correctly? Is it ICD-10 compliant? ICD-10 is built into enki Endoscopy Report Writer. During pre-op diagnosis, findings or impressions, enki will allow you to choose the correct ICD-10 code from a complete list by entering just the initial word. It’s simple. Your billing team can use these reports to complete billing. If you are interested in our billing services (our team is outstanding! ), you can click here. 12) Can I customize my endoscopy report note? I need a professional looking document that I can confidently present to my referring providers and patients? Yes, we will customize the reports to your needs. We also provide professional-looking templates that make you look great with other doctors and patients. 13) What happens to my data if I decide to switch from you? Your data is always yours. If for any reason you choose to switch from us, we will give your data and images to you in a standard format. If you require specific formats, we might charge a nominal cost. Just so you know, we are not in the business of wasting your time or ours by playing the game of fine-print. When we begin a relationship, we think of it as a long term one for life. 14) What kind of Internet upgrade do we need to run a cloud-based system? If you are able to run YouTube without too much buffering on your Internet bandwidth, you will do fine with enki ERW. Our system is optimized to run on moderate-high bandwidth. It’s unlikely you will need an upgrade if you have a 1+ Mbps Internet connection. It’ll also help to hardwire your Internet connection instead of using a wireless network. 15) What are the hardware and computer specifications that we need to have? enki ERW is built for the Chrome browser. You don’t require expensive hardware to run enki. As with the bandwidth test, if your computer doesn’t hang or crash when you run YouTube videos then it’ll work well for enki. Make sure you have the latest Chrome browser and an Operating System running Windows 7 or Mac OS X 10.7. Close all other tabs and browsers while using enki. Based on the make of your endoscope system, we will provide the connector cable that connects the endoscope generating the images and computer hosting enki ERW. The reason you are reading this is because you care more about taking care of patients than being bogged down with other distractions of practicing medicine. Not paperwork. Not software problems. Not expenses. Better software means you can focus on better quality of endoscopy. Faster access to information. Higher levels of patient satisfaction. Go ahead. Simply plug and scope.